Deb's Cup of Tea: Where Are We? States like to advertise themselves. How do you make yourself look different from your neighbor? How do you let people know when they have arrived in a new state? Signage! You pay an advertising company a lot of money and they come up with "Iowa: A State of Minds". Then, you cringe as realize how people will take that moniker and decide, no, that's not going on our license plates or on the signs that welcome you to the state. As I traveled to Virginia, those signs were a delineation of just how far I'd gone. Here is Indiana's, reached at 7:15 in the morning. Trust me. It's Indiana. 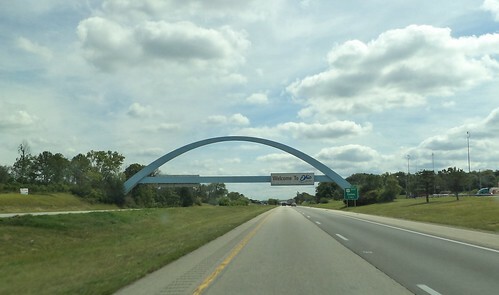 It's a simple blue sign with the state in red and white "Welcome to Indiana" across the face of it. At 12:30 p.m., I reached Ohio. Two simple arches with the state's sign affixed to each. Indiana's is metal while Ohio's is cast concrete painted robin's egg blue. It's graceful. I don't know about elegant, but it's a clear indication of arriving in Ohio on I-70. It says, simply, "Welcome to Ohio" with the "Welcome to" in red, with a script "Ohio" in blue. Heading southeast, I've reached West Virginia by 3 p.m. 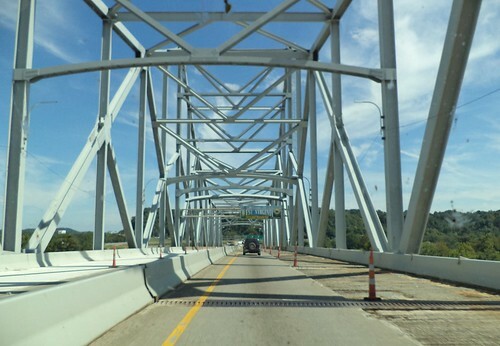 The US 35 bridge over the Ohio River was under construction. 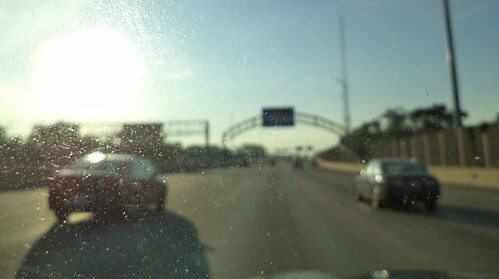 Traffic is reduced from 2 lanes to 1, but crossing at this time wasn't too terrible. I would imagine this could be bumper-to-bumper in the morning or in the evening as people go to or come home from jobs on the other side of the river. West Virginia's sign is an image of blue sky and mountains with "Welcome to West Virginia" in white letters. The state seal is on the right side of the sign. Below the welcome is the slogan "Wild and Wonderful" in sunflower yellow. It's distinctive but maybe a touch too busy, although it does grab your attention. Finally, there is the Virginia sign which was stuck to the side of the road. It's mountainous at the location where West Virginia meets Virginia. The graceful arches of Indiana or Ohio wouldn't be appropriate here. This is what one usually thinks of when you think of a state sign. It's something stuck in the ditch by the side of the road announcing you've moved from one marked spot on a map to another. 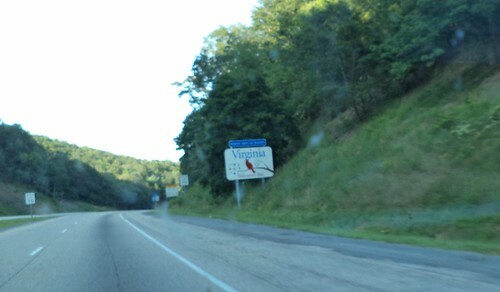 The sign reads "Virginia Welcomes You". "Virginia" is in blue with "Welcomes You" in red. There is a cardinal sitting on a dogwood branch on this sign. The blue extension at the top announced the welcome area was 2 miles ahead. It was 6:30 p.m. by now and I still had 3 hours ahead of me. I have to say this sign gave me a great feeling of relief. The journey there was nearly over.